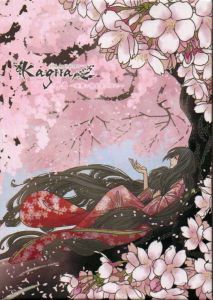 Although I’ve heard Kagrra, before, I don’t have an extensive knowledge of their discography, and had never heard any of the music from the live. That said, I was struck by how the music has a cohesive sound despite having a wide variety of styles and instrumental combinations. 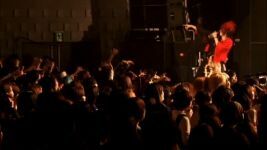 The “slow songs” like “Rin” and “Satsuki” are slower only in tempo; they maintain intensity without becoming smarmy or sugary like traditional ballads. “Uzu” has an interesting tempo profile and is the first song in the concert to feature koto; “Shizuku” has a lighter feeling than the songs before it, with a lot of finger-picked acoustic and long notes on the electric; “Shiroi Mashu” and “Boukyaku no Hate no Kogoeta Kodoku” soar with a nostalgic feeling that made me want to listen to them over and over; songs like “Koi,” “Paraizo,” and “Sai” are faster and make you want to move. The individual member performances are also very strong. Akiya (guitar) and Shin (guitar/koto) are constantly adjusting their foot pedals to tweak the sound of their guitars from song to song, and both have acoustics on standby to switch to mid-song as necessary. Shin in particular is impressive for juggling the koto in addition to both guitars. Nao’s bass lines are strong and complex, adding flavor and color to the music, not just rhythm. Izumi’s drums are subtle, but tight and emotive. Isshi’s vocals are powerful and well-performed for the most part, though he has some trouble reaching some of his falsetto notes at the beginning of the concert and has occasional trouble with maintaining tempo. Isshi’s strongest point, however, is the timbre of his voice, which is the best suited to VK that I’ve ever heard - a perfect balance between smoky baritone and fairly strong falsetto. Other than the few vocal issues, however, the overall quality of the music is incredible - even with the flaws, the live versions of these songs are so beautiful and emotive that I’d rather listen to the concert than to an album or single. However, despite the great music, the DVD is no fun to watch. The lighting is uninspired, the camera work ranges from uninteresting to downright bad (member's faces are often covered by mic stands or instruments), and the projector screen does almost nothing interesting until almost the very end, when it shows black and white video from previous lives that is sure to bring tears to the eyes of any Kagrra, fan. Even the members themselves are reserved for almost the entire concert. 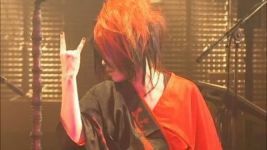 Other than Isshi, who is constantly engaging the audience with dance, waves, and encouragement to sing, the members do very little to interact with the crowd or cameras until “Sai,” just three songs until the encores begin. 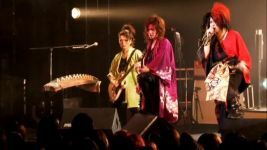 The most interesting visual aspect of the DVD is actually the crowd themselves: seeing the beautiful kimono that many of them wear and watching them perform the traditional Japanese dance moves that go with each song is much more interesting than anything that the members do for 99% of the concert. These failings, however, are minor compared to the editing choices made on the DVD. There are only two MCs recorded, which seems strange - one would expect that the band would want to engage with the fans more than that during the final concert of their career. My instincts were correct: after watching the DVD a few times, I found at least two places where a whole or partial MC was cut out, and after some research I found that there are five more MCs missing after the end of the encores. It seems that, although each member addressed the audience before they left the stage for the final time, the DVD editor didn’t see fit to include these parting words. Although this is something that people who didn’t attend the concert would likely never have noticed, those who did attend are certain to be missing this material. Perhaps the editor believed that the content on Disc 2 would make up for this shortcoming on Disc 1, but they are powerfully mistaken. Disc 2 is individual member commentary on each song performed in the concert - which is interesting if you understand it - but those final MCs were a window into each member’s soul. Without them we can see a few moments of sadness - a tear or two on Isshi, tired and sad looks on Izumi and Shin, but little else. For those who were able to attend the live in person, those MCs would have been a beautiful reminder of their final evening with the band. For those who were unable to attend, they would have been a priceless opportunity to connect with the members one last time. That they were cut is criminal. This puts me in a very awkward position as a reviewer. Although the editor of the DVD couldn’t have anticipated that Isshi would pass away, this DVD represents his last public performance. No more hope that Kagrra, will somehow get back together and be the same as always; no more hope to see Isshi again in his solo project; no idea when or if the other members will make public appearances of their own. The words and emotions of the band members from that night are lost forever. By that logic, shouldn’t the fans cling to whatever tiny moments they can? I’m afraid it’s a choice you’ll have to make on your own. As someone who wasn’t a strong Kagrra, fan before they broke up, I don’t think that this DVD offers enough to be worth the time, energy, and money it’ll take to track it down, since it was a limited release. But for the true fans, I just can’t say. Maybe those final fleeting moments will be enough for you. Or maybe you already have something even better in your current collection.